Just Skirts and Dresses: diy: hot bottle cover - 'Koeka Antwerp' kruikenzak knock-off! 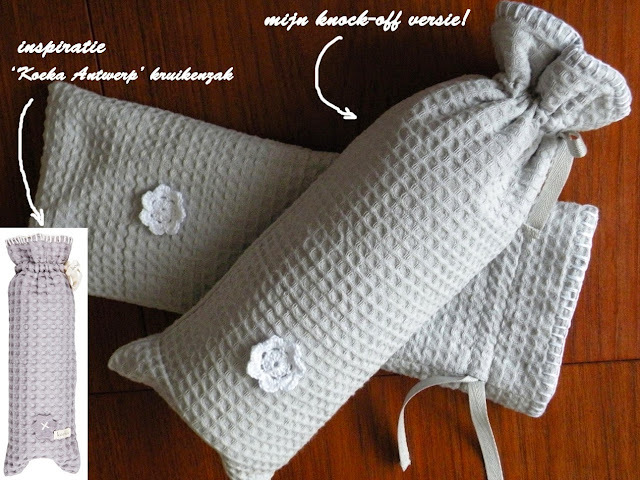 diy: hot bottle cover - 'Koeka Antwerp' kruikenzak knock-off! Now that I'm finally on maternity leave I have the time to finish my list of baby-related sewing projects. The first one is making hot water bottle bags! In The Netherlands, you need to purchase two, stainless steel hot water bottles for the baby's bed, to keep the temperature warm and comfortable during the first weeks after birth. Metal bottles seems odd and old fashioned, but when handled properly, they are safer to use than the rubber ones: there is no risk of tearing, leaking, and they stay warm longer. I've got mine second hand, from a friend. Of course, the bottles can't be placed in the baby's bed without a cover. You can buy all kinds of bottle bags, from really cheap and simple to quite expensive, like those of the Dutch brand 'Koeka'. Their 'Antwerp' series of baby textiles features waffle cotton with blanket-stitch edges. First I made the two layers. The inner layer is stitched to a width of 13.5 cm, with the seam allowances on the outside. Clipped the corners and pressed the seams open. Then I made the outer layer from the waffle cotton (which I prewashed and put in the hot dryer to let it shrink as much as possible). For a snug fit it is just slightly larger than the inner layer: 14 cm wide. The layers were assembled with the seam allowances between the two layers. (the bathtowel layer with the s.a. on the outside and the outer layer with the s.a. on the inside. Before doing that I added a little crochet flower embellishment (about 9 cm from the bottom up) I used this free crochet flower pattern. Since I love handsewing and my bathtowel layer was a little shorter than the other layer I hand-stitched the edges (bonus: the stitches are not visible from the outside) Before stitching I've put a bottle in the bag to make sure everything was pulled tightly and was free of wrinkles.